Author Philip Pullman is returning to the world of Lyra Belacqua with his new trilogy The Book of Dust, the first instalment of which was released at midnight. La Belle Sauvage: The Book Of Dust Volume One is published on Thursday, Pullman's 71st birthday, and comes 17 years after the last instalment of his previous trilogy. While Lyra, from His Dark Materials, is one of the key characters, the action takes place when she is six months old. She is being sheltered by nuns but then 11-year-old Malcolm Polstead steps in to protect her on his canoe, La Belle Sauvage. So what are the tricks of the trade that has made Pullman such a success - and the tips he can pass on to budding writers? He spoke to the BBC about his lucky pen and why he can work to the sound of a pneumatic drill, but never to music. 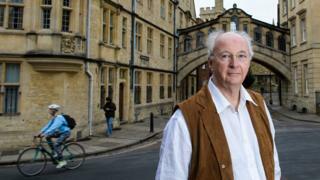 Image caption Philip Pullman: "I like being in a state of doubt"
It's a mysterious process. Of course, part of me must be making them up. But it doesn't feel like making up - it feels like discovery. Basically, I sit at my desk and stare at the wall blankly until I find my pen moving over the paper, for want of any better word. I don't want to get all mystical about it, but it does feel like discovery rather than invention. It's like the story is already there and I've got to find the best way to tell it, rather than make it up. It's a curious business and I'm not at all sure about it, but I don't want to be sure about it really. I like being in a state of doubt. 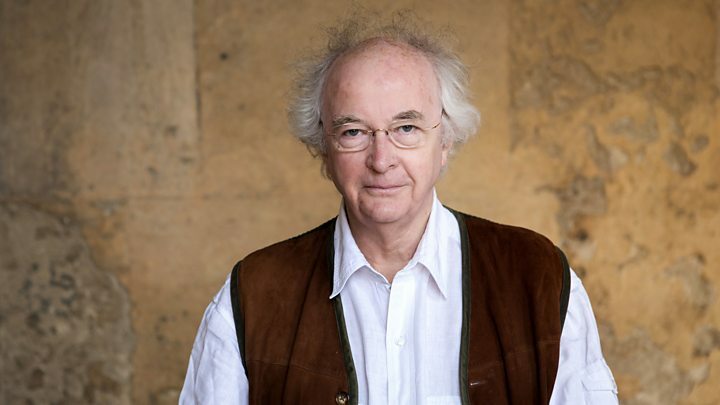 Media captionSeventeen years after His Dark Materials, author Philip Pullman reads from its new "equel"
After I'd finished His Dark Materials, I had a sense there were more stories there. Lyra's story that I tell in His Dark Materials, that's come to an end, that's finished. But there are always other stories. At the end of His Dark Materials, Lyra is only 12 years old, and she's going to grow up and she's going to be an adult. Things are going to happen to her and she's going to make things happen. And I was curious about that. At the edge of my vision, so to speak, out of the corner of my eye, I could see other characters which I became interested in. I gradually found my pen wandering over to that other world again. I had done quite a lot of other things, but this new story became so compelling and so interesting - and the new characters were so attractive to me - that I just couldn't resist. I never think it (my writing) is good. The most I think is, "Well, that will do". When I'm writing, I'm more conscious of the sound, actually, than the meaning. I know what the rhythm of the sentence is going to be before I know what the words are going to be in it. That's a very important factor in the way I write. That's why I can't write with music playing. Some writers do, but I couldn't begin to do that. Silence? Yes. Pneumatic drills? Fine. Traffic noise? No problem. But music is an absolute killer. So I have to have silence, so I can hear the rhythm. I sort of know where things are going - but I don't know the way to get there. As for not structuring - well, I do. But structure comes later. Structure is sometimes seen as being a fundamental thing. It isn't. Structure is a superficial thing. What is fundamental in a book is tone, the tone of voice, and to change that is to change every single sentence. But you can change the structure at the last minute. You can say: "I'll start in the middle", or whatever. The structure is there, but it comes later. I use a ballpoint pen and paper, initially. I do that because I know it works - and I've got a lucky pen. It's a Mont Blanc ballpoint. I use it because it's a perfect weight and a perfect size. And it works. I've written several books with it. I couldn't do without it now. If I lost it, I don't know what I'd do. So I do that first. Then every chapter or two I put on the computer, because that's the best editing tool ever invented. When you're writing, you have to please yourself because there's no-one else there initially. But the book doesn't fully exist until it's been read. The reader is a very important part of the transaction - and people have to read things they want to read. I'm writing for me - I write for all the "me's" that have been. From the first me I can remember, the me who first got interested in stories and loved listening to them; to the me who was here at Oxford 50 years ago; to the me who was a school teacher, telling stories to the class. All of these. I'm writing for me. And I am lucky to have found such a wide audience - and an audience which contains both adults and children is the best of all.